Harry Vinicombe was born in Kyneton in 1893, the son of Albert Orchard and Ann Mary Vinicombe (nee McGrath). His mother Ann died in 1900 at Kyneton and his father became a manager of a property at High Camp Plain. Harry attended Pyalong School and later became a motor driver and chauffeur. He enlisted on July 7, 1915 in Melbourne and for a month was stationed at B Company, Flemington Depot. Harry was then posted to the 2nd Reinforcements, 29th Battalion for training. He embarked on HMAT Demosthenes at Melbourne on October 29, 1915. By January, 1916 Harry was in the Suez, Egypt, and soon after spent 8 days in hospital with tonsillitis. Following further training Harry was allocated to the 45th Battalion as a private, 1781, on April 2, 1916 at Serapeum. The 45th Battalion was raised in Egypt on 2 March 1916 as part of the 12th Brigade of the 4th Australian Division, and arrived in Marselles on June 8, 1916, for transfer to the Western Front. It fought in its first major battle at Pozieres in August, defending ground previously captured by the 2nd Australian Division. Harry was injured in action with multiple gunshot wounds on August 6, 1916 and next day, being dangerously ill he was transferred well behind the lines to Camiers where he died in the 4th General Hospital on September 14. Harry was buried in nearby Etaples Military Cemetery in France. Harry was awarded the 1914/15 Star, the British War Medal and the Victory Medal. It would seem he was promoted to Lance Corporal at some time. His name is recorded on the Pyalong State School Honour Roll. During the war his father was living in St Kilda where he received by post Harry’s effects including a photo and letters. Later he received Harry’s medals, a memorial scroll and plaque. His brother Thomas also served in World War One returning home in 1919. Herbert Thomas Skehan was born in Melbourne St, Kilmore on January 30, 1889, the eldest son of Patrick and Amy (nee Grose) Skehan. He was educated at Assumption College, Kilmore and graduated Dux of the school in 1909. Up until the time of his enlistment Herbert was a clerk in the tobacco trade in Melbourne and was engaged to be married. 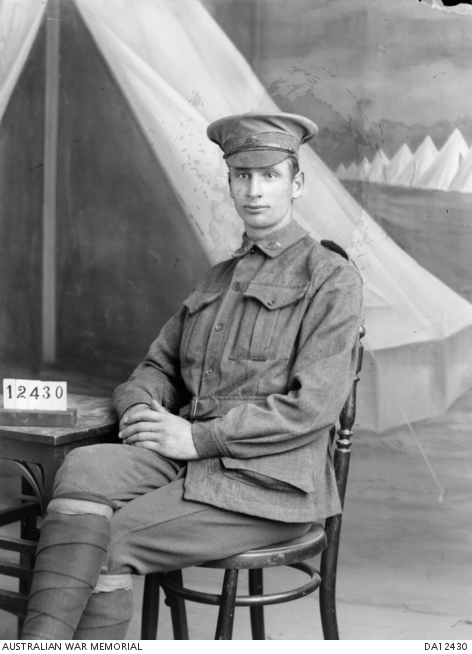 Herbert enlisted at Broadmeadows on July 28, 1915 in the 3/29th Battalion, AIF. During training he was acting Corporal from 26 August to December 16, 1915. He embarked at Melbourne on the HMT Ballarat on February 18, 1916, and disembarked at Suez on March 22, 1916, and was taken on strength with the 29th Battalion on April 1, 1916. The Battalion then transferred to the Western Front via Marseilles in June, where they took part in an attack against the German positions at Delange Farm in July, then held their positions for 11 days including a heavy counter attack. During front line action Herbert was hospitalised with Influenza in November 1916 at Etaples, then again in hospital with frost bite in February 1917. He was transferred to the 5th Army School from May 21 to 27, 1917. After returning to his Battalion Herbert took part in the Battle of Polygon Wood near Ypres in Belgium which commenced on September 26, 1917. He was killed in action on that day. The following is an eyewitness account by Corporal W J Marshall, – He was killed by a shell at Polygon Wood, I saw his body soon after. He was buried in a shell hole near where he fell by a party from the company. No cross was erected at the time, he was a machine gunner, and was in No: 5 Platoon, B. Company. After the War Herbert’s remains were exhumed and re-buried at Ypres, Belgium, in the Duhallow ADS Cemetery. His father Patrick, as next of kin, received in 1921 a Memorial Scroll, Herbert’s British War Medal, Victory Medal and 1914/15 Star, and a photograph of his headstone. .
Herbert’s name is recorded on the Kilmore War Memorial, the Kilmore Shire Honour Roll at the Memorial Hall, and on the Assumption College Honour Roll.